You have spoken! The votes are in, we have a winner who won by a landslide! 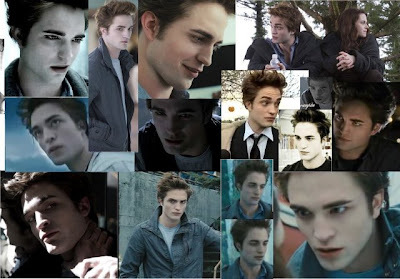 The most swoon-worthy "book boy" is none other than my personal favorite, Edward Cullen. Oh, and if you need a visual for just how beautiful Edward Cullen really is, I've provided you with a collage of Robert Pattinson's portrayal of Edward in Twilight, the movie. Do I really need to say "swoon" again? The second movie is due out in theatres in late November of this year and is currently filming. Hello all! I am so sorry about my recent lack of updates. Life has gotten in the way of any kind of leisure. BUT, I am back in action and will try to be more frequent with my updates. I thought that I would give an update to where I am with my 999 Challenge!Just a reminder for those who do not know/do not remember what the 999 Challenge is: You choose 9 categories (they can be anything! ), then you read 9 different books for each category, and you read them all in 2009! This means that if you complete the challenge, you will have tackled at least 81 books for the year. No double dipping with your categories! The should also be books that you haven't read before (unless you have a "Rereads" category, like I do). Here is my list, the books that I have already read are in bold. The other books are the ones that I am tentatively planning to read to fulfill my categories. This is where you come in. If you see a book on my list and think you know of a better one to help me fill that category, I would love some advice! Have any replacement suggestions? Leave me a comment! Sawyer, and Sayid, and Jack... OH MY! 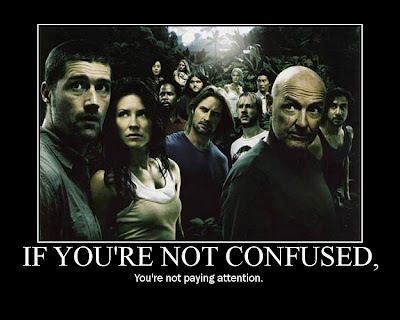 LOST is probably one of my favorite television shows ever. My best friend turned me on to the show about two seasons ago, and I am hooked. Every Wednesday night I am glued to the television to see what horrible thing Ben is going to do, and how many times Sawyer (see picture to the right) will come up with witty insults to snap at other people. And like everyone else, I wait in suspense for the end of every episode to get some answers. Instead, I am left with 45 new questions, and I love every minute of it. But since this is a blog about books, and not television, I found a little reading list that I thought was very interesting. Throughout the show, there are references to many different literary works. Most of them come through Sawyer, the bad boy who stole my heart. While I was searching for book lists online, I stumbled across a list of books that are referenced in LOST. Some I've read, and others I've added to my TBR list! I thought it would be fun for all of you to take a look at! So there you have it! Some of these books are tied directly into the show, and others have similar plot lines. But they all sound worth reading!